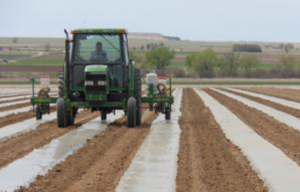 Spring cantaloupe planting is under way in Colorado, and following a tragic foodborne disease outbreak last year, growers are determined to regain consumer confidence. In 2011, over 30 people died and at least 146 were sickened during a Listeria outbreak traced to contaminated cantaloupe blog. Jensen Farms, the source of the Listeria outbreak, is located near Holly, Colorado, about 100 miles east of the Rocky Ford region, which was initially identified in news reports as the “epicenter” of the outbreak. Those reports took an economic and reputational toll on all Rocky Ford cantaloupe growers. This spring, as cantaloupe seeds are being pressed into Colorado soil, growers are taking aggressive measures to shore up their practices to avoid a repeat of last season’s catastrophe. Rocky Ford Growers Association: According to The Durango Herald, growers have formed an association with self-imposed rules to promote safe cantaloupe production. The newspaper reports farmers who join the association must agree to twice-a-year safety audits—one announced and one unannounced—conducted by state Agricultural Department inspectors. Only association members will be allowed to use the Rocky Ford trademark. According to the newspaper article, Jensen Farms will not be asked to join the association reportedly due to its distance from the Rocky Ford region. It is unclear, according to the newspaper, whether Jensen Farms will resume cantaloupe production this year. Growers in the new association will adhere to stringent food safety standards developed by Colorado State University and California researchers to avoid the problems that led to Listeria contamination at Jensen Farms. In particular, cantaloupe post-harvest processing will include rapid cooling and chlorine disinfectant in wash water. Both measures help curtail the growth of Listeria and other bacteria; both were lacking in the Jensen Farms packing shed. In an effort to provide increased transparency for customers, including consumers, the Rocky Ford Growers Association has hired a tracking company to monitor cantaloupe from seed to store, identifying any problems along that path. KOAA.com reports consumers can use smartphones to read a QR code on a sticker that tracks produce back to the seed and farm from which it originated and the date of its harvest. In some cases the sticker will be on individual melons, in other cases they may be on packing crates. Wash fresh produce thoroughly under running water just before eating, cutting or cooking, paying special attention to the convoluted outer skin of produce such as cantaloupe. (see www.FoodSafety.gov for more information). Clean and sanitize food-contact surfaces (see the FDA web page, “Keep Listeria out of Your Kitchen”). 1QR codes are small, 2-dimensional, square icons on products and advertising material that one can hold a smart phone up to in order to access product information instantly.